Fresh look, upmarket interiors and a new heart. Are these enough to add some funk to the ageing EcoSport? Ageing is not a term we would normally associate with the Ford EcoSport. The compact SUV was designed to be quirky enough to remain interesting (read relevant) even five years after it was originally launched. However, in keeping with recent car trends and Ford’s ambition of all its cars having a common signature look, here it is. The pictures you see here point to not just a nip-and-tuck cosmetic procedure but a major rejuvenation surgery. And it's not just the outside. The interior has received a makeover as well, with new and interesting features thrown into the mix. Is it enough to claw back market space from the Suzuki Vitara Brezza, Honda WRV, Tata Nexon and the new Renault Captur? We think so. In a segment where there isn't a fixed design directive and every car looks radically different from the next, the new EcoSport manages to stand out, and looks premium while doing so. Gone is the quirkiness and in its place is a cleaner looking front. The headlamp is a larger, swoopier unit with new projector lighting and LED inserts. It provides a wider and brighter light spread than the earlier units. Interestingly, the turn indicators have been moved away from the headlamps and are a part of the fog lamp assembly now. The bumper is new and makes space to accommodate the large grille, which is a one-piece unit now. This trapezoidal grille has become Ford’s defining design feature, appearing in all its new cars. Move on to the sides and you will notice the large 17-inch alloys wrapped in lower profile tyres featuring a new, sportier design. One nifty feature are the sensors integrated into the door handles. Key fob in pocket, simply touch the door handle to unlock the car. To lock it, simply swipe your thumb against the handle. This feature when used in public results in a lot of raised eyebrows and dropped jaws. Side and rear design remains the same save for redesigned wheel covers. It seems like Ford has focused on the front end of the car and that's fine as there was nothing wrong with the side and rear profile anyway. Overall, the update does manage to add an air of premiumness to this compact SUV. Now this is where the EcoSport shines, especially in the tech department. Its new dashboard comes with a new centre console, above which sits a large 10-inch touchscreen unit. This, though, is available only on the top-end Titanium and Titanium+ variants. The ones below get a smaller 6.5-inch screen while the base version gets a slot for your smartphone. A large display makes for easy viewing and while the screen does seem to stick out from the dashboard, you can fiddle with it without having to stretch much. While the infotainment system misses out on navigation, it gets both Android Auto and Apple CarPlay. With the latest SYNC 3 interface, the capacitive screen has a crisp feel and is as quick to respond to inputs as any of the latest flagship smartphones. The instrument cluster is new as well, a large unit flanked by circular speedometer and tachometer readouts with a digital display in the center. They look premium except for the small monochrome display which leaves a lot of empty space in the console. While it’s not lacking in the information it displays, such as distance to empty, fuel efficiency and also tyre pressures on individual wheels thanks to an integrated tyre pressure monitoring system, we wish we got the same large colour TFT screen that’s on the international Ecosport. These modes can be toggled via buttons on the new steering wheel lifted from the Ford Focus. Now larger than before, the steering has thick contoured rims that are a joy to hold, while the brake and accelerator pedals gets a sporty satin aluminium finish. Door panels are new as well and feature an elevated elbow rest placed a step above the panel for power window switches. As it is with the outgoing EcoSport, you are seated high up. That said, visibility upfront could have been better as the car’s A pillars are wide enough to hide a two-wheeler in your sightline. There are a lot of storage spaces and cubby holes inside the cabin, though, space being at a premium, you can't store bigger items here. For example, the storage space below the arm rest between the front seats is deep but has a narrow opening. Seats have been revamped as well, with the front ones getting a wider back and extra cushioning. They are comfortable but still feel small, especially thanks to the underthigh support which ends way before your knees. Rear seats too are revised with better cushion contouring but suffer the same ignominy of limited under thigh support as the front seats. The middle seat has lost its headrest, but it now hides a foldable armrest replete with cupholders. This move strictly makes the EcoSport a four-seater but some in our team felt the middle seat has become more comfortable than before despite the stashed armrest and missing headrest. And despite the scooped out front seat backs, leg room remains an issue for anyone above 5ft10in whether in the front or the back. Boot space remains the same 352 litres but it gets usable features like a new, solid parcel shelf instead of the roll-back one on the previous iteration. It has a notch which allows it to stay in a locked open position so that you can load stuff without worry. You also have a movable floor that can be adjusted to three positions. At its topmost position and with the rear seat backrest folded, the loading back becomes flat. The rear seat can also be completely folded to liberate upto 1178 litres of storage space. The cabin is smartly packaged and feels more premium, a big plus since you will be spending most of your time in there. For this year, Ford has done away with the critically acclaimed 1.0 Ecoboost petrol and 1.5-litre four-cylinder petrol engines. These have been replaced by a new 1.5-litre three-cylinder petrol motor. Also new is a six-speed automatic transmission which replaces the previous dual-clutch automatic transmission. The new petrol motor has been heavily worked on in the areas of refinement and eliminating vibrations typical of a three cylinder motor. It makes 123PS at 6500rpm and 150Nm at 4500rpm. It is a refined unit and makes most of its power in the low to mid range rpm. The first thing that strikes you is the motor’s refinement and how well Ford has been able to insulate the interiors. There is minimal engine noise entering the cabin. Vibrations too are non existent and the only time you are reminded that it is a three-cylinder motor is during startups. It is a peppy unit with good low down torque. This motor is also free to rev and starts to wake up post 2000rpm, helping the EcoSport reach 80kmph fairly easily. Unlike the previous EcoBoost unit, you don't get shoved into your seat, but rather get a linear push every time you step on the accelerator. Performance isn't a real highlight here, refinement is. Under test, the EcoSport did the 0-100kmph dash in 12.51 seconds. Where the EcoSport impresses is in the flexibility offered by the engine-gearbox combination. In Drive mode, gear shifts are seamless and make for a relaxed driving experience. The 20-80kmph roll-on under kickdown test took 7.57 seconds. Pretty good for a simple-tech automatic transmission. At low speeds in Drive mode, the gearbox tends to stick to higher gears, keeping the engine between 1500-2000rpm at speeds below 50kmph. This is below the optimal rpm where the engine is really responsive, so each time you want to get a move on, you need to give much more throttle input than normal. The end result is poor fuel efficiency in the city, where the EcoSport managed just 7.04kmpl in our tests. While this behaviour of the gearbox is far from bothersome in the city, this tendency of shifting to a higher cog too soon and the reluctance to downshift quickly make highway performance feel lacking. In order to overtake, you need to depress the throttle quite a bit, making progress slower. However, drive at a steady speed and this gearbox does a great job of conserving fuel. And steady speed driving on open roads is fairly easy too, thanks to the inclusion of cruise control. On our highway tests, it managed an impressive fuel efficiency figure of 17.12kmpl. In Sport mode the demeanour changes -- the gearbox allows the motor to rev a bit by holding onto the gears longer. But then it also holds on to the gear past 5000rpm, which takes it out of its powerband, resulting in a drop in performance before it shift to the next gear. To get rid of that dead spot, you can shift up using the paddle shifters. There is no separate manual/Tiptronic mode that you can stick the gear selector into. Instead, you just tap either paddle and the gearbox goes into manual drive. Upshifts in this mode take a bit of time, especially at higher revs. Downshifts though are fairly quick. It wont allow you to shift up to a higher gear if speeds are low. It will also drop down a gear if you are in a higher gear and have to slow down. It is a good gearbox to live with if you drive mainly in the city and aren't exactly pushing it on the highway. While a lot of work has gone into updating the engine and interiors, the suspension gets just minor revisions. While overall setup remains the same, Ford has revised the suspension bushes for better damping. The result is a softer, more cushioned feel. You still can feel the road surface, but now you are better insulated from it. It still has a lot of vertical movement and you do feel the hard ridges and sharp bumps filter through the cabin. This movement in the suspension is also felt when braking hard from high speeds. The front end of the car dips more than the earlier car in such situations and the whole thing feels quite dramatic. That said, actual braking performance is respectable, and even the ABS feels attuned and works well during panic braking scenarios. 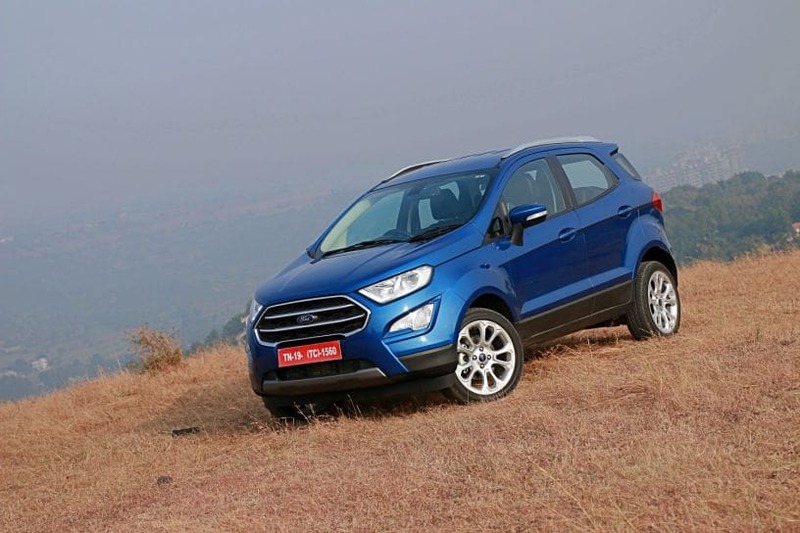 In our tests, this EcoSport managed to come to a stop from 100kmph in a distance of 42.75m. The EcoSport was always a good handler and does not lose any of its car-like traits. The only difference now is a bit more body roll than before. This manifests during high speed turns when the car tends to lean in the opposite direction more than you expect. In such situations, it needs constant small steering inputs to keep it behaving exactly as you would want it to. Thankfully, its steering, like most Fords, is a joy to use. It’s larger than before, and hence requires less effort to turn. To top it off, it’s still direct and precise, so while you still need to be a bit cautious at high speeds, throwing the car around turns at slower speeds feels absolutely great. The top-of the line EcoSport Titanium+ gets six airbags while all the other variants make do with two. This variant also gets projector headlamps with automatic on/off system. Rain sensing wipers is another addition. While all variants come with ABS, the top variant and automatic Trend+ variant get electronic brake force distribution, electronic stability control, traction control and hill climb assist. The Titanium+ variant also gets 17-inch wheels paired with low profile 205/50 R17 Ecopia rubber from Bridgestone. The low rolling resistance tyres work well, displaying good amount of grip in dry conditions and keeping noise levels at a minimum at high speeds. Even during our braking tests, they displayed minimal drama, helping the vehicle track true and shed speed quickly. Again, it is only the top variant that gets a reverse camera with dynamic guiding lines. The camera has two views (normal and top view). While reversing, the sensors take into account the spare tyre hanging on the tailgate but it's better to leave some leeway and not completely trust the system. Priced at Rs 10.99 lakh, the top spec petrol EcoSport is an expensive proposition, but it does offer features that would be more at home in cars a full segment above it. The new EcoSport has not changed drastically, but has evolved into a more sophisticated, feature-rich package that should entice the millennial looking for a city runabout. And the fact that it offers rugged good looks in a compact, city-friendly package, while also delivering the convenience of an automatic, really makes it an appealing option. Granted that the new petrol motor isn’t especially frugal in city conditions, but some of that low efficiency can be compensated for by manually shifting gears using the steering-mounted paddles. And it is very refined, with enough poke to make quick city commuting a breeze. Sure, if you wanted a car to carry more than four adults with lots of luggage, this EcoSport isn’t the best choice. But it should still satisfy the odd craving for wanderlust with its larger ground clearance and bigger wheels. At the end of the day though, this is a car that has been made to handle the urban jungle better than the real one, and in that environment, it really does a great job.